As the story runs Kate Nash, a 20-year-old British girl, started her music career quite accidentally. She actually wanted to become an actress and even tried to enter Bristol Theater School but as far as she was rejected this stage of her celebrity career came to nothing. Few days after she was hanging about her house where she fell down a flight of stairs, breaking her foot, and this in result gave her an idea of writing a few songs of her own. Not because she fell down of course but because she had absolutely nothing to do during the recovery time. Eventually the foot knitted and Kate decided to give a small concert in a local bar. And now, as they say, the plot thickens. Somewhere in early months of 2006 Kate uploaded her songs to MySpace and owing to possibilities of this global web site her music soon began to receive support from users, and Nash also found herself a manager. She released her very first single called Caroline’s Victim in February. Her second single Foundations was released in June and unexpectedly reached a number 2 in the official UK singles chart. And finally, following this success her album Made Of Bricks saw the light of the day in the first dates of August – five weeks earlier than originally planned. So what is so special about Kate Nash and how does she manage to attract crowds of potential fans? Perhaps, this happens due to the fact that Kate Nash is frequently compared with Lily Allen. It sounds quite informative to get an approximate idea about her style but actually this is rather a hype tool. Lily Allen did make a few positive comments about Nash but this is it. The common traits of these two are simply that they both sing little, cute pop songs about girl - boy relationships and have distinctive London accent. Thus, it seems like the main reason of her popularity entirely depends on her innate talents. You must admit that it is almost impossible to rise to the highest chart lines due to questionable support of one celebrity. 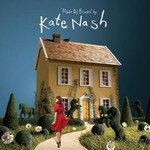 Of course, you shouldn’t expect that Made Of Bricks is a ground-shaking album but Kate Nash can still offer a number of really good songs. This concerns Foundations first of all and such tracks Mouthwash or Merry Happy/Little Red prove that catchy tunes are rather regularity than accidental coincidence. The main points that make Made Of Bricks worthy of listening is the unusual style of music and Kate’s distinctive voice. It is hard to tell why but this combination really works. The songs as such are quite simple but they sound extremely peculiar at that. This is definitely pop but overall sounding, arrangements and melodies have nothing to do with modern mainstream. There is something from indie rock’s esthetics here but if you’ll try to give this record an intimate listen you will hardly find any characteristic features of this genre. Besides Kate’s voice adds something mysterious to the music but it doesn’t sound gloomy quite on the contrary this is her voice that makes it so positive. She mostly sings in a low register and therefore she sounds very calm, tender and even homelike. Listen to Pumpkin Soup or Skeleton Song – these songs sound quite demonstrative and what is the main thing here memorable. Overall Made Of Bricks is a pretty interesting album. It’s not a masterpiece of course but it really deserves your attention and most likely you will listen to this record for the next couple of months.